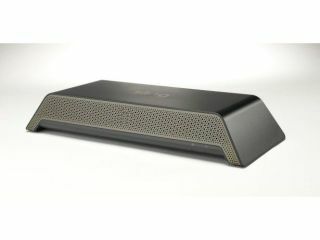 Sling Media has announced the UK launch of its high-definition TV streaming device, the SlingBox Pro HD. The latest bit of kit from Sling allows you to stream high-definition content from your main TV at home to other SlingBoxes around your home or, more interestingly, to your laptop or mobile phone. The SlingBox Pro HD will set you back £250. However, just make sure that you have enough bandwidth to stream that data-heavy HD telly to your other devices before you invest in Sling Media's new top-of-range kit. The SlingBox Pro HD is available right now from the likes of Amazon and PC World, featuring both standard and widescreen video support, plus support for over the air DVBT digital signals, HDTV cable or satellite receivers, or HD PVR's, on a laptop or desktop computer. "Millions of people are enjoying the benefits of HD quality pictures at home, creating a huge market for new products like Slingbox PRO-HD. With Slingbox PRO-HD, our customers can placeshift their HD programming without sacrificing the quality of the picture," said Stuart Collingwood, VP EMEA, Sling Media. "Slingbox PRO-HD marks a giant leap forward in hardware and software development from Sling Media, such as powerful encoding enhancements. All of this means the Slingbox PRO-HD delivers a delightful user experience and amazing picture quality." SlingBox is also launching SlingBox.com, an online version of the SlingBox client, so you can stream your TV to any computer without having to download any software. "Slingbox PRO-HD is designed to meet the varied requirements of today's multi-faceted TV-viewing households," continues the company. "The product includes standard (4:3) and widescreen (16:9) video support and features multiple integrated sets of audio-video inputs and outputs…and features integrated looping outputs for each input. "Slingbox PRO-HD transforms PCs, laptops, Macs and a variety of smartphones (including the Android platform) into personal, portable TVs and builds upon the goals of the original Slingbox – to give consumers the freedom to view their home TV programming anywhere." For more check out www.slingbox.com.